​Donald Kirkpatrick's groundbreaking Evaluating Training Programs is the most widely used training evaluation model in the world. The third edition, published some 10 years ago and with more than 65,000 copies sold, was the lasting legacy that began in 1956 when the four levels were first introduced. 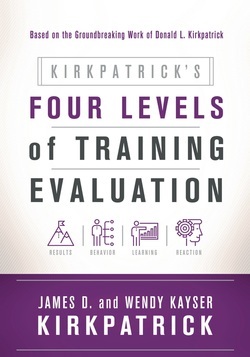 Now nearly 10 years after the last edition, the Kirkpatrick name is back in print and here to present a NEW WORLD Model for managing training evaluation. James and Wendy Kirkpatrick, who carry on the Donald's tradition, but in a more modern methodology have updated the process to work, and prepared a blueprint to implement a model that maximizes business results and delivers useable metrics for C-Level Execs in today's business setting. The New World Kirkpatrick Model as presented in this brand-new book, Kirkpatrick's Four Levels of Training Evaluation, delivers what it promises: superior help for organizations and a way for Learning & Development teams to better train people, improve how they work, and, ultimately, evaluate their training that shows how training contributes toward goals while concurrently balancing budget and tasks. ​Translation rights available for sale now! Chinese (simplified characters) and Polish language rights already sold! Jim and Wendy Kirkpatrick travel the world speaking at many events and hosting more than 50 seminars and workshops each year. For a complete list of where the Kirkpatrick name will be appearing, please click here. In 2016, look for them in Singapore, France, the United Kingdom, Sweden, Austria, New Zealand, Australia, India, Poland, and Romania to name a few. James D. Kirkpatrick, Ph.D. is a thought leader and change driver in training evaluation and the creator of the New World Kirkpatrick Model. Using his 15 years of experience in the corporate world, he trains and con­sults for corporate, government, military, and humanitarian organizations around the world. Wendy Kayser Kirkpatrick is a global driving force of the use and implementation of the Kirkpatrick Model and leads companies to measurable success through training and evaluation. She is a recipient of the 2013 Emerging Training Leaders Award from Train­ing magazine.